After the cows and five more locks came Cuckoo Land #narrowboat #England – The Diesel-Electric Elephant Company. Escaping the attentions of Gertrude, the 007-licensed Government Attack-Cow, of our previous moorings came at a price. The Adderley Locks, five in a row, followed by some miles of what I have come to term the “DNS Canal”. “DNS” standing for “Do Not Stop”, a sentiment forcefully expressed by everywhere having the most outrageous examples of the “Shropshire Shelf” that I have encountered to date! There just isn’t anywhere to moor up that doesn’t require an onboard crane and some sort of breeches buoy arrangement to get a chap onto the towpath. Tis crazy, tis crazy maximus. My breakfast wore off entirely while I cruised and looked for somewhere to moor. That somewhere presented in the form of a “Market Drayton”. A “town”. This town having suddenly introduced itself an angling contest equally suddenly made itself known, all of the towpath and moorings between Bridge 64, Lord’s Bridge, and Bridge 63, Betton Bridge, being covered in chaps drowning maggots and worms. Drowning them, it must be said, as though their own lives depended on snuffing out that of the bait. Drowning them with the use of twenty or thirty foot-long carbon-fibre rods, running I don’t doubt into the thousands of pounds. Each angler had with him a pile of equipment suggesting that they had all bought one of everything out of the Angler’s Essentials Catalogue. That said, they were for the most part (50.1% versus 49.9%) a cheerful bunch, and the first angler that the Cardinal and I passed called out that my speed was ‘perfect’ and that if I might continue to stick to the middle of the cut (as I was doing) then this also would be ‘perfect’. The Cardinal and I cruised then under what may only be described as some sort of “Mexican wave salute” of raised fishing rods. But I wasn’t forewarned, so I didn’t. Although I may do next time. I shall leave a tomato on the rear deck, it might go better with a slightly mouldy fruit… a more colourful splatter to accompany my screams. Anyhap, the war on fresh-water herring or spawning lumpsuckers or whatever it was that is in season (it is that was in season?) rather precluded use of those devilishly attractive-looking moorings. Damn it and, if I may say so, tsk tsk. Through the next bridge though we found ourselves without warning quite atop Market Drayton Services, which is a delight that had entirely slipped my mind. Overwhelmed with emotion I slithered us to a halt on the hand-brake and, it has to be said, I… smiled. With hindsight I am ashamed of the outburst, but well, what is a chap to do when he’s been DNS’d and angled into a frazzle? Not the fastest tap in the west, but a welcome tap all the same. Blessed be the white bollards of service, for they may be moored to while the main water tank refills. Rubbish, gazunders, potable water cans, all done. Splendid. The water-point tap, it has to be said, gave fresh and pithy meaning to the word “dribble”, but while it slowly pithed I wandered about, assessing …stuff & things. Once the tank was full I cruised the Cardinal forwards, threw out a couple of ropes and rang down “Finished with engines” on the Chadburn repeater. 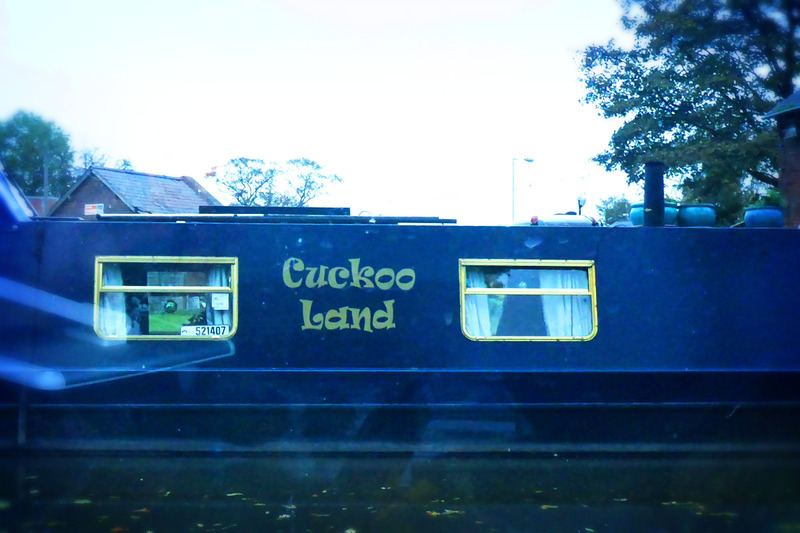 It was only then that I realised that I had moored directly opposite Cuckoo Land. All change, no change. Plus ca change, plus c’est la meme wibble moo fribble de-clomp. Urban the moorings may have been and with a busy towpath, but I stayed there two nights. Market Drayton has bright lights, and an ASDA, and – drum roll – a Chinese takeaway. I took away a takeaway, and it was splendid. First one in years, I kid you not. Last one for some time to come, too, I suspect, but I shall have my memories. Would you like a close-up of Market Drayton Services? I thought that you would. Here they are, on the left, opposite the CaRT depot. The billions of anglers were all dipping their wicks, or something, whatever you term it, on yon side of this bridge. The bridge at the bow, however, is the one with more promise, for it leads away from Market Drayton and the lure of bright lights and easy living, towards another five locks and a cut described on the maps as being so narrow that “there is not always room for two boats to pass”. Market Drayton’s “The Chinese Takeaway” is under the bridge, up the slope on the other side to the right and about half or a three-quarter mile into town. No ship, Sherlock. That’ll be fun if we encounter traffic. Have you ever reversed a narrowboat? I have, and it is an art-form requiring mastery of Luke Skywalker’s “The Force”. I’ve been down some of that promised land today, and I’ll tell you all about it in the next blog post. The Cardinal and I, on this wee cruise, are now well into terra incognita. There is much new to grok. I didn’t spot Gertrude following me, although it’s just possible that she was using a snorkel or something, and I did forget to check for a trail of bubbles. That’s one of the (few) nice things about urban moorings, aside from the bright lights, ASDAs and Chinese takeaways – there are no cows. Chin-chin for the moo, chaps. Oh bugger. Did I just say “moo”? Chin-chin for the mo, chaps, is what I ought to have said. I’m obviously still under the influence. Gertrude sees all, knows all. Bwhahahaha! “Drowning maggots and worms” – hilarious description of the day and travels (resisting a tomato prank must be almost impossible). Reversing boats are a finely skilled task…maybe easier to tell them to reverse…. I’m always amazed by the amount of equipment anglers have with them these days. When I was knee-high to Nanny it was just a rod, some bait and maybe a net. Now they all have a trolley and it is so laden that they can hardly wheel it along – some of them can’t even see where they are pushing it, the boxes being piled higher than head-height. It must add to their fun, I suppose.. I didn’t have a Chinese take away for many years, maybe I should try one. There is a nice Chinese restaurant nearby, I should give them a chance… Thank you for the fine blog post, the pictures and the inspiration. Egads, sir, thank’ee! Sinbad is a fine name and I am proud to wear it even if only temporarily. Heavens! Don’t lead us on and leave us guessing!! Chinese what? Call yourself a writer – most take aways have an abundance of dishes of the vegible kind, it’s been so long for me. I expected dingy for urban, but it looked quite nice and when you get somewhere do you have prior knowledge on what’s available within walking distance…..I know I’m nosy, I assume you have one of those app thingies that pin point nearest places…do any of these eateries deliver? No this is not really research for a new book…..not really! Vegetable fried rice, extra mushrooms and a bucket of that extraordinary and unique Chinese take-away curry sauce… reet gradely. Carbohyrate-laden, and undoubtedly laced with MSG sufficient unto a year’s safe intake, but reet gradely all the same. App? My poor mobile telephone barely makes or receives a call in six months (just enough to keep it alive, occasionally I have to call wrong numbers to stop Orange/EE cutting me off as an abandoned number… I believe that there are such “apps” but I don’t actually know that for a fact! The canal guide (map) books give details and enough of a map to begin finding the centre of towns, and it’s a guess from there… I haven’t tried the delivery thing, I must confess that I am not really much of a take-away hound these days, once or twice a year is quite plenty!